This “3 Questions” features Jackson Wright Shultz author of Trans/Portraits: Voices from Transgender Communities . Mr. Shultz has long been a mentor for youth with behavioral disorders and serves as the Education Director and an executive board member of the non-profit organization, TEACH Alliance. 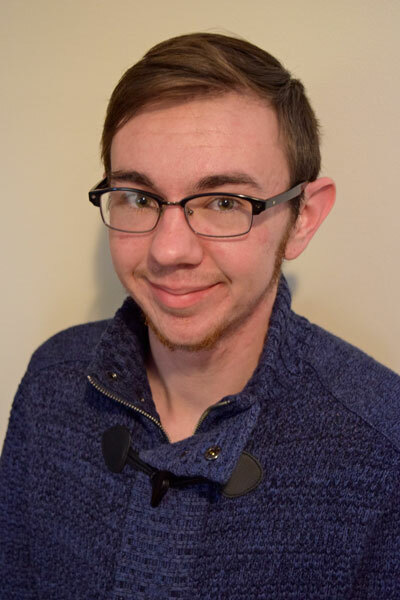 Originally from Washington State, Mr. Shultz recently completed his master’s degree at Dartmouth College and now teaches creative writing and composition at New England College, where he is working toward his doctorate in higher education administration. Mr. Shultz will be visiting the Norwich Bookstore at 7 pm on Wednesday, January 20th to discuss his latest book, Trans/Portraits: Voices from TransgenderCommunities . In this work, Mr. Shultz gives voice to people who are often silenced as he records the stories of more than thirty Americans who identify as transgender. His subjects range in age from fifteen to seventy-two; come from twenty-five different states and a wide array of racial, religious, and socioeconomic backgrounds; and identify across a vast spectrum of genders and sexualities. The event with Mr. Shultz is free and open to the public. However, reservations are recommended as space is limited. Call 802-649-1114 or email info@norwichbookstore.com to save your seat. 2) What three books have helped shape you into the author you are today, and why? My favorite genre is historical fiction and I love books that eschew conventional writing expectations, so Alice Walker’s The Color Purple is one of my favorite examples of creative prose. Another favorite is Stone Butch Blues by Leslie Feinberg. Not only do I relate to Feinberg’s protagonist more intensely than any other character I have ever come across, but the writing is enviably beautiful in its frank vulnerability. On the flip-side, I think it’s crucial to avoid taking oneself too seriously, so David Sedaris’ hilarious Me Talk Pretty One Day is a work I’ve read repetitively over the years. Both as a writer and as an activist, Janet Mock’s work is critical in the ongoing push for transgender rights. Her book, Redefining Realness, is a poignant autobiography of transition and transformation. I would dearly love to discuss the politics of gender liberation with her over a macchiato. The number of books I have in my to-read queue roughly equates to the size of the Library of Congress. As I pluck away at my doctoral dissertation (in education), I am currently reading Paulo Freire’s Pedagogy of the Oppressed. The next in my line-up is Ta-Nehisi Coates’ Between the World and Me, about which I have heard nothing but praise. And, for a considerably lighter read, I await the opportunity to finish S. Bear Bergman’s Blood, Marriage, Wine & Glitter.